Espresso Gift Sets | The Perfect Choice for Your Coffee Lover! 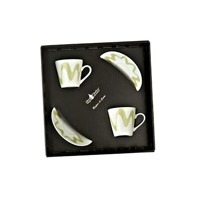 Elegant Espresso Gift Sets are Perfect for Any Occasion! Give the gift of rich, Italian espresso to the coffee lover in your life! This line of Top Moka Queen of Hearts Espresso Gift Sets features Moka Pots in a variety of sizes and colours to suit any personality. Don’t forget to add an extra set of matching espresso cups to your selection! Order Sophisticated Espresso Gift Sets Today! Present your coffee lover with a lovely set of cups and saucers designed to match their favourite Mini Moka Pot. Perfect for espresso, latte, coffee or tea, the Moka Pot Accessories Cups and Saucers Gift Set includes six place settings to satisfy a table full of guests. 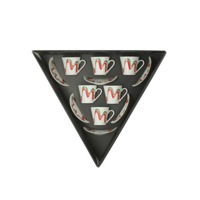 Don’t forget to add the Top Moka 2 Cups & Saucers Queen of Hearts Gift Set to your choice of Moka Pots! With an extra set of matching cups to complement your new coffeemaker, you’ll enjoy your morning coffee even more!